My ginger girl, Kylie has a great love for TOMS. But typical of most TOMS, she's worn her toes right through the edges. Somehow she doesn't wear holes in the tops like the majority I've seen. She's gotta make it a bit harder and wear them out right at the sole. When it came time to repair them, I searched Pinterest for the best way to do it. I ended up using a few different techniques. One or two I came up with on my own, the others I borrowed from some pretty smart ladies! The first tutorial was by Leah at Leah Miren blog, the second was by Cheri Heaton at I Love to Create Blog. 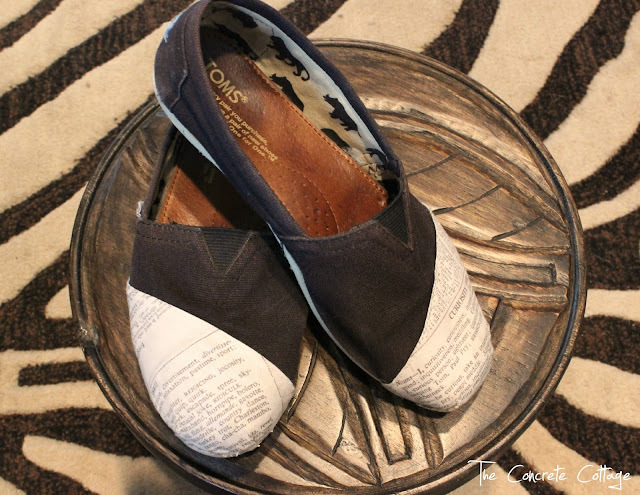 Leah's blog talked about using an iron-on twill patch to reinforce the toe. I had to take it a bit further though since the side of her shoe was completely torn out. I started by placing a piece of the twill patch on the inside of the shoe and ironing it on. This pulled the gaping hole together and gave the patch on the outside something to adhere to. The pic above is what it looked like at this stage. Once they were fully patched, it was time to make them look pretty. Check out the I Love to Create Blog to get all the details on the amazing adhesive sheets I used. I applied them exactly like she did. To prepare the fabric, I went back to Leah's blog and sewed the top edge using her instructions. Once the fabric was adhered, I used my fabric scissors and cut as close as possible to the sole. After making a clean edge, I finished with a line of Fray Check to prevent it from raveling. 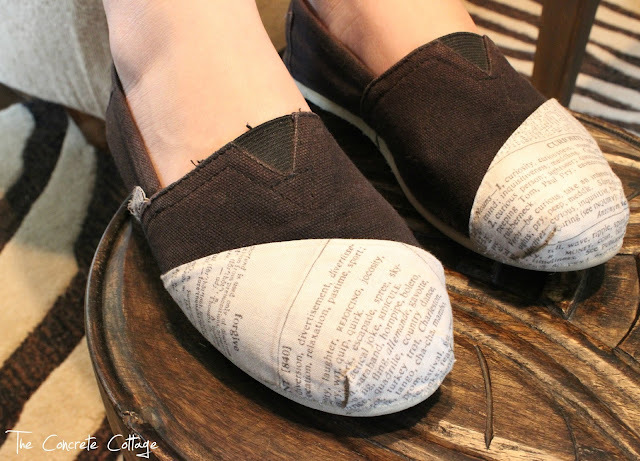 It's awesome that as these get dirty, it'll look like the book pages are aging. The ginger girl complained a bit that they felt kind of tight after being patched. My thoughts... "your toes are no longer hanging out kid, of course they're tighter!" She insisted they were tighter than when they were new. I insisted that they were canvas, thus STRETCHY! After wearing them for a day, she admitted they were loosening up. I almost forgot to tell you. I started a facebook page last week. You can click on the link HERE to go to my FB page, or click on the facebook icon at the top of the page. Thanks for hangin' out with me today!! Dang it...I commented yesterday and it disappeared. It was something witty and sisterly, but I don't remember what I said. I love the material and they look like they were designed that way. Great job!!! i wear my black Toms so much, it's a wonder they don't have holes in them, but when they do, I'll know there's a fix. These are so cute!!! Great to know they can be repaired, thanks for sharing. This will be hepful! I've never worn a hole in my Tom's, but I sure do wear down the sole. This is a cute idea. I'll need to file this for future use. This may be the most creative project I have seen. Great job! Great idea, my teenager daughter will more than likely wear some holes in hers :) Found your post on Somewhat Simple! 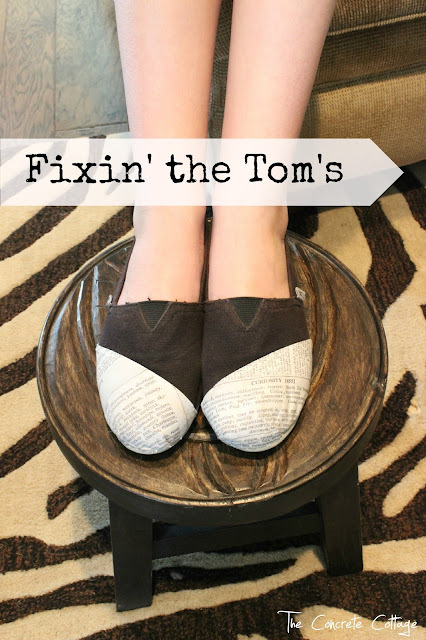 Stop on over and link up at our Super Sunday Link Party, surely our readers would enjoy knowing what to do when their Toms get holes! 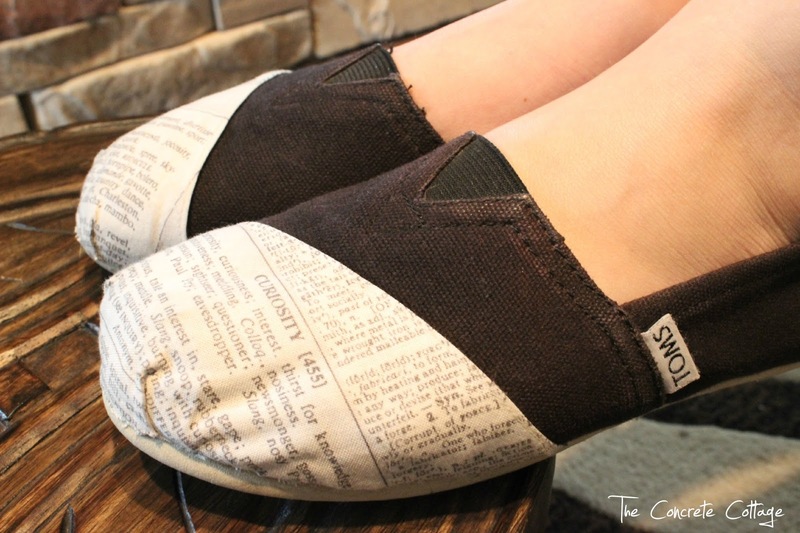 Those turned out so cute and I love my Toms. I have about seven pairs. Super cute project! Well done! Thanks for sharing! Just wondering, how old were those shoes at the time? How long did your daughter wear them for to get them like that? I'm asking because my niece is begging for a pair of Toms shoes so I might buy her a pair for her birthday, I was wondering how durable they were. 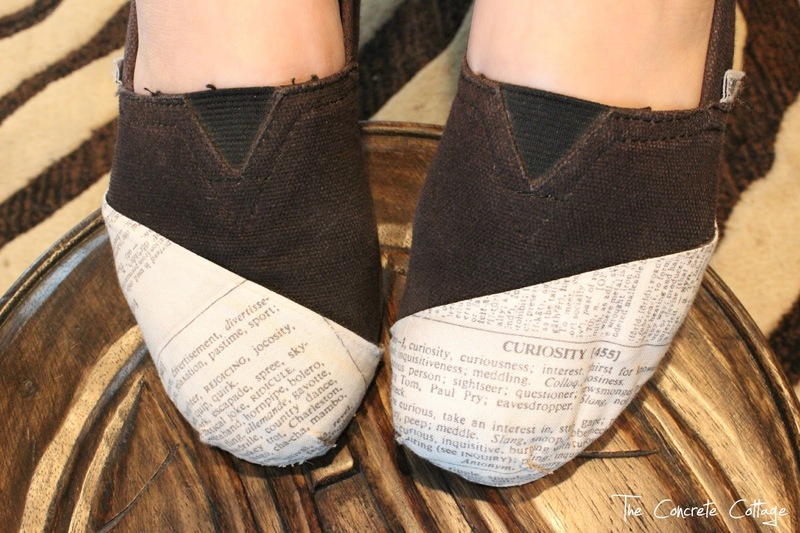 Nice work repairing those shoes! 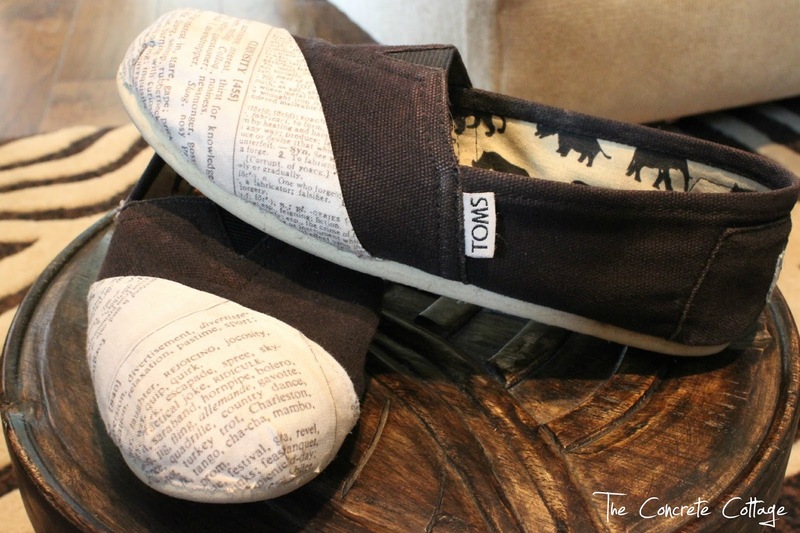 If I buy my niece a pair of Toms, I may also have to forward this to my sis. Pretty sure she's had them at least 2 years. Probably hasn't worn them much in the last several months though cuz they looked like the pic above. My oldest has a brand new pair that we were comparing, and it's seems like maybe it's made a little sturdier now. I'll have to remember this. I love my Toms too!